Using coupons in the store can be hit or miss depending on which cashier checks you out. You may have an issue with a coupon that limits you to “one per transaction” or “one per purchase”. If your cashier is new to the job or doesn’t use coupons, he or she may not know the difference between the two. And, yes there is a difference. A big one! One of the best things to do when you are given a hard time over a transaction or purchase limit is to stay calm. Getting angry with your cashier will only create animosity and, quite possibly, you may end up walking out of the store without using your coupons. Instead, take the time to show the cashier the difference between the two terms. The cashier may not realize that there is a difference. Informing them in a calm and collected manner will only help you (and maybe other customers, too) in the future. So what is the difference? After all, you can’t inform the cashier if you don’t know yourself, right? When a coupon says “per purchase,” it means per item. In other words, if a coupon says “Save $1.00 off 1” and then “one per purchase,” this means that you will be able to use one coupon for each individual item that you buy. If you want to use a coupon on 4 items, you will need 4 separate coupons. Now for the “per transaction” part. It breaks down very easily like this: a transaction is each time that you pay. If a coupon says that you can only use “one coupon per transaction” that means that you can only use one of the same coupon each time that you pay. If you want to use two? You must pay twice. This is the reason that you see some couponers paying two, three or more times at the store. Always read the fine print on your coupon before you head out shopping. I’m noticing quite a few coupons are now “per transaction”. I much prefer the “per purchase” coupons so I can buy more than one of the item with a coupon. Coupon limits aren’t too hard to work with. Follow the limits, politely educate the cashier if you need to and your couponing life will go much smoother. Check out my other posts about couponing and saving money: 17 ways to save money on groceries, how to save money on groceries with Checkout 51, why I’m not price matching anymore, how to price match with flyers, 10 sites to find coupons online in Canada, 20 ways to save money on electricity, how to save money shopping online and four apps to save money on groceries in Canada. 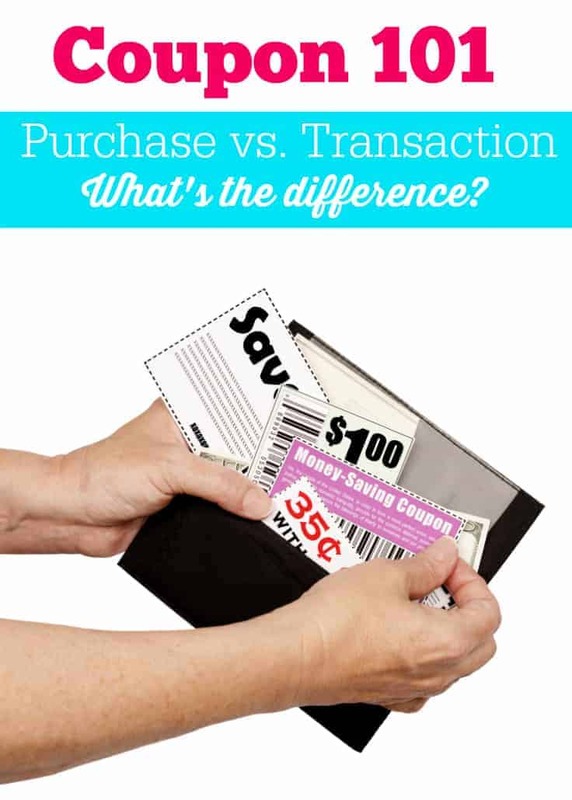 Have you ever had to explain the difference between per purchase and per transaction? I’ve been using coupons quite a bit more and didn’t know this difference. Although, at CVS with the various beauty coupons, I do know that I have to pay for items in groups to get the best deal. Thanks for the helpful information! Thanks for explaining the difference, will be helpful in using coupons. To date I haven’t had this issue. Often when I have more than one coupon for the same item, they hesitate and call another cashier/supervisor over. Too bad merchants don’t train their staff on this. I have had to explain the difference at Walmart when the cashier said that it is one coupon per transaction, when my coupon said one per item. She called the manager and the manager said that it is correct. I used 4 coupons on my 4 items that time!